When we were shopping for a Phoenix Cruiser, we didn't want a slide out, but couldn't find any pictures of a PC with a no-slide dinette. For anyone researching a PC to purchase, you may find this of interest. Also for the curious. 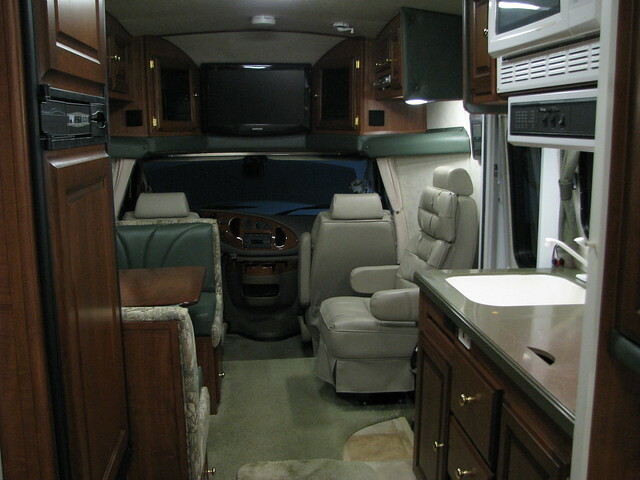 Here is our older 2007 model 2350 with a no-slide dinette. Most other floor plans offer the same no-slide out option which saves a lot of money and weight. We love this much more than a slide out. The table in current day models are wall mounted with a single table leg at the opposing end, which improves leg room, and is easier to convert to a bed. Though hard to see in the first picture, the cabinets over the dinette are extra large. They really hold a lot. We use it to store non-perishable food and purchases on trips. On weekend trips with a guest, that space works great for the guest's clothing and other personal items. Bench storage has access from the side doors and also by removing the cushions. In current day models, you might get drawers in the benches. We requested the sound system subwoofer be mounted in the forward bench, as far from the rear corner bed as possible. This improved the utilization of our outdoor storage under the rear corner bed, and also kept the noise level down when one person is watching TV and the other is taking a nap. 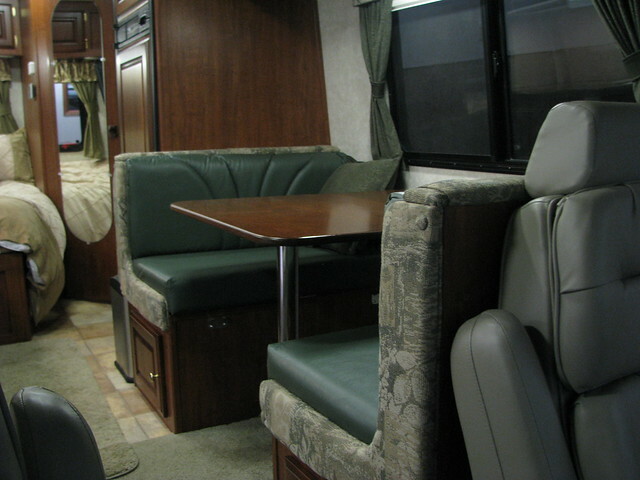 The dinette allows people traveling in back a place to play cards & board games, and also look out the window. While I drive, my wife loves to set up her lap top computer, a drink & a snack. She'll play computer games or manipulate vacation pictures & videos, all done while watching the world go by. If you can do without the extra floor space of a slide out, and don't need the slide-out bed for two more people, what we have is worth consideration. PCs might be special ordered with a dinette in a slideout instead of the typical couch. I know that used to be an option. We once sat in one like that to find the benches are much closer together providing much less leg room and the table is much smaller. We cannot recommend a dinette inside a slide out unless the slide out is bigger as used in the 2450 and 2552 models. I think the dinettes made today have a big drawer here. Ron, I loved the pictures of your dinette and the extra storage cabinets on top. Sure wish I had seen this before ordering our sofa with the slideout. We picked our motorhome up on October 31st and while it is beautiful, I really don't like the slideout or that little sofa. This idea would have been much more useful for us. I hear you and don't dispute your conclusion, especially when your PC is planned around the needs of two people. We are still very happy with our choice after 3 years of ownership. We would special order it the same exact way. Ron, you got me thinking! I like the extra storage space. The corner bed-when the person beside the window has to get up in the middle of the night for the head, it's difficult crawling out of the bed. That got old when we spent 3 monthes in New England and the Maritimes. The other reason was the difficulty of watching tv. The tv is up so high, it strains the neck. The 2551 has twin beds-GREAT-and a lower tv. And a terribly hard ride. Now, if PC made a Sprinter with twin beds, we would have our 3rd PC. 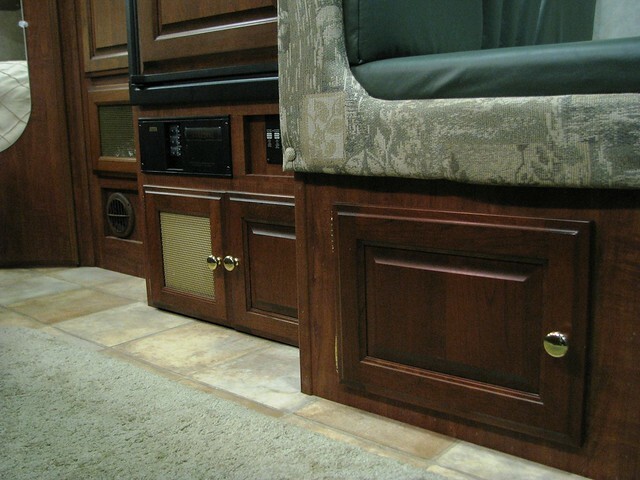 If you can deal with the bed issue, you will love the Sprinter! 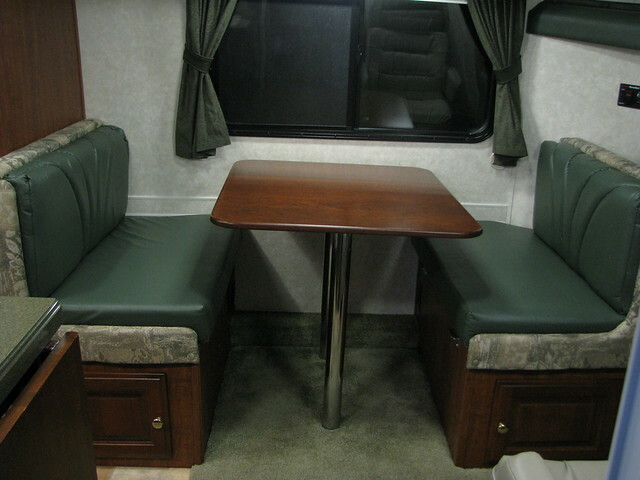 When we had the 2551 built, instead of the dinette, we had it made with 2 captains chairs and the table. We call it our "2551 for Two". When in discussion with other PC owners of 2350s with slideouts, the lack of storage does seem to be a problem for them. Our dinette benches do offer a lot more storage, and we utilize all of it. The higher ceiling above them also has taller overhead cabinets for more storage there too. We use them for cookware and all non-perishable food. With the 2350, we have a whole lot of exterior storage as well. We never have issues with storage. But I do have to admit, the dinette is not something to sit on for hours on-end. I understand why some people like Judi & George ordered theirs with two captain chairs and a swing-up table. But that does sacrifice the two bench seat storage areas and the single convert-a-bed. That single bed has come in handy a few times for us. Once I got sick on a trip and needed to sleep alone for 3 nights. In another situation during a weekend get-away with family at a private camp ground, the place surprised us with a one pup tent per site restriction. We quickly had a house guest which we were happy to accomodate. With our 2350, we replaced the uncomfortable barrel chair by the entry door with a 3rd captain seat. At least then one of us can get comfortable. In the middle of watching a movie, we will take an intermission and then switch places. We could NEVER consider any twin bed model. Our first night saying "Good Night Honey" from across the isle would have us quickly squished together on one of the twins. We would much rather deal with the limited access of the rear corner "double" bed. The slideout today with the fridge included weighs over 300-400 pounds more than one without a slideout. You would have much less concern of over-loading the chassis, especially a Sprinter. The 2450 is a 2350 made one foot longer to provide a pull-out pantry on each side. You have the option to sacrifice the pantry next to the stove to get a longer double bed for easier entry/exit. Ron, do you have new storage locations for these images that are missing? I just cleaned up the initial post. All is well again. "But I do have to admit, the dinette is not something to sit on for hours on-end. I understand why some people like Judi & George ordered theirs with two captain chairs and a swing-up table. 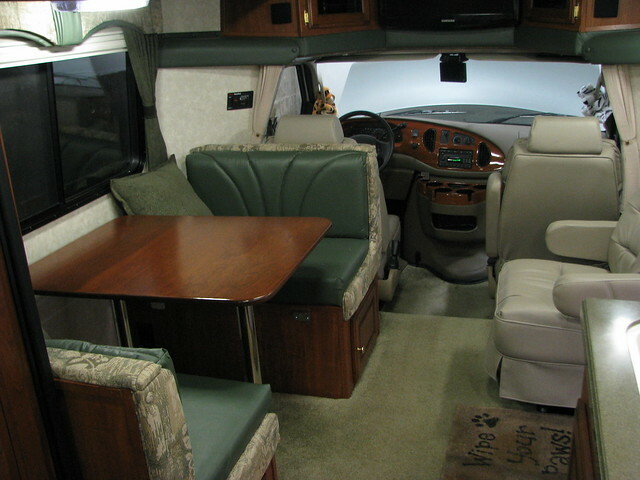 But that does sacrifice the two bench seat storage areas and the single convert-a-bed. That single bed has come in handy a few times for us. Once I got sick on a trip and needed to sleep alone for 3 nights. In another situation during a weekend get-away with family at a private camp ground, the place surprised us with a one pup tent per site restriction. We quickly had a house guest which we were happy to accomodate. We could NEVER consider any twin bed model. Our first night saying "Good Night Honey" from across the isle would have us quickly squished together on one of the twins. We would much rather deal with the limited access of the rear corner "double" bed." Ron on one hand you say once you got sick and sept on the dinnette and on the other you say you could never sleep alone, Which is it? Ron on one hand you say once you got sick and slept on the dinnette and on the other you say you could never sleep alone, Which is it? We sleep together all the time, except a few nights during that one trip when I got very ill and didn't want to give my misery to my wife. There is always an exception to every rule....right? Maybe I should have said "with rare exception", but then the questions and implications would pour in, like...Do you fight often?